It is said that one of the signs of becoming older is when a person begins to reminisce about his or her past and what happened during “the good old days.” Now I won’t admit to how old I am or whether or not this saying has any validity, but I will acknowledge that lately I tend to recall and talk a lot about what happened to me growing up “back in the day.” One of those special times was when I was a kid growing up and celebrating Christmas in Oakland. It was during our annual Christmas pageant, which was held on Christmas Eve at our church. Now there are a lot of Christians who do not believe in putting up Christmas trees. I’m not one of them, and I won’t waste time arguing or explaining why I choose to have a Christmas tree. I hadn’t put up a tree in years until I found a small artificial tree in storage that belonged to my late and beloved sister. It’s only 4 ft 3 inches tall, but it made me feel close to her. 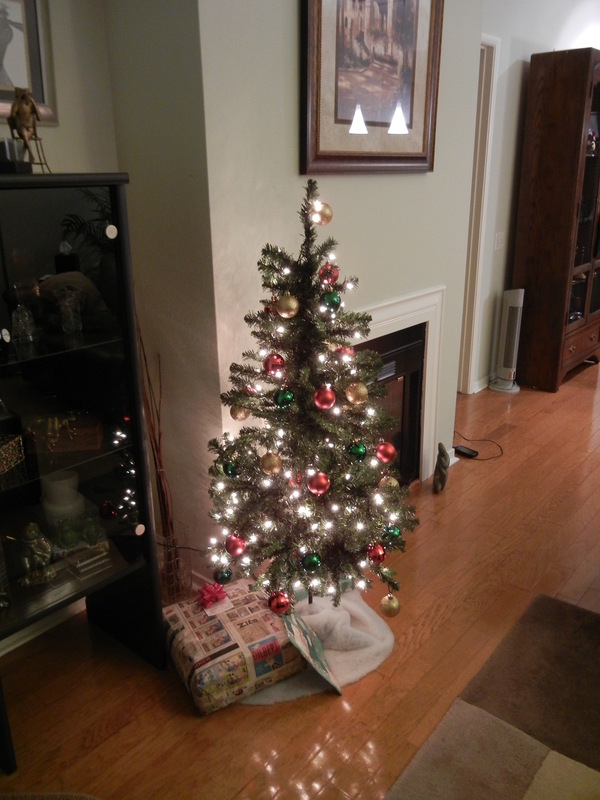 I put a few ornaments on it and it brought back fond memories of her and Christmases past. When I turn the lights on at evening time I can feel her presence with me still. As Christians we can sometimes be too religious. We can destroy the beauty, joy, simplicity, and imagination of children with some of our beliefs, teachings, and doctrines about Christian holidays. I don’t worship a tree, graven images, idol gods (paganism), or any other such foolishness. There are some traditions I just love and Christmas is one of them. I love the tradition of giving and receiving, family gatherings, food, sharing with the less fortunate, and the overall spirit one feels at Christmas time. It goes without saying that the whole purpose for this season is to celebrate the birth of the Christ Child. Our annual Christmas pageant was always on Christmas Eve night and sponsored by our Sunday school and youth ministry. It was not a huge production like churches produce today with special effects, sound, and audio visuals. It was very simple and predictable. Stage props were made using whatever materials were available. Nothing was ever purchased. Costumes were self-made using old choir robes or bath robes from home to make shepherd, wise men, and other traditional garments. Bath towels were used to cover the head and sandals for foot ware. Some people just wore their shoes, went barefoot, or wore white socks. Baby Jesus was always a white baby doll borrowed from someone’s daughter’s doll collection to contribute to the Nativity scene. Everyone volunteered and was creative. Most times we just depended on the audience to use their imagination. Everyone did their best to make the production, stage, and the telling of the Christmas story a unique experience for our church, families, and friends. Some pageants and Christmas programs were better than others, but they all had that spirit of caring and fellowship. Mostly, teens and young adults participated in the play (and a few older adults). Learning our parts and Christmas speeches/poems were always the biggest challenge. We made lots of mistakes and forgot our lines, but we also had so much fun getting ready for the big night. Preteens were given Christmas speeches or poems to learn and recite at the pageant. We learned to project our voices so the people in the back of the church could hear us. Some kids were excited just to be asked to be stand-ins as a shepherd or wise men, or to be any character in the play. It was the responsibility of the program director to give each child in Sunday school and our youth ministry a Christmas speech or poem. It was written down on a little slip of paper and given to parents to make sure their child could recite on the night of the program. The Christmas play would always tell the story of the birth of the Christ Child. We were no different from any other church I’m sure. The director stood off stage to whisper lines to anyone who may have forgotten their part. There were plenty of giggles and laughs throughout the entire play. I can still remember as a little kid watching this poorly done Christmas play thinking it was the real thing. I looked up to those who had the confidence to stand in front of a crowd of people to speak or sing. It was during these special moments I learned the art of speaking and performing before an audience. Here is where my many teachers and mentors shared their gifts and time—and not just me—to all the kids of our church. The audience was always forgiving and encouraging to our mistakes. They clapped and sang along, and we never knew how bad we really were. Another part of the evening’s celebration was exchanging gifts. Every member in our church (including children) drew names from a brown paper bag, tambourine, and sometimes the offering plate. The names would be recorded so that no one would be forgotten or left out. A few extra gifts were purchased just in case someone did forget or couldn’t afford to purchase a gift. It was very important to have extra gifts for children on hand. There was nothing worse than looking into the face of a disappointed child whose name wasn’t called or was forgotten. No one tried to outdo another. Gifts were given in love and people genuinely gave what they felt was appropriate or affordable. No one was embarrassed at the gift received or given. The Sunday school superintendent usually dressed up as Santa Claus or one of the deacons, if the superintendent was female. At the end of the program he would come out and do the traditional, “Ho, ho, ho!” Our little eyes would beam and our faces would light up with smiles and giggles! We had a black Santa before black Santas became the cultural “thing.” With the help of the Sunday school staff he would call out the names written on each present underneath the tree, and the gifts would be distributed. Brown paper bags filled with nuts, candy, and fruit were given to everyone in attendance. No one left the pageant without something. It seemed like forever before I heard my name called. When I finally heard it, I jumped out of my seat with a big smile on my face and walked proudly up to one of the helpers to receive my gift. Other kids did the same. It was Christmas and it really didn’t matter what was inside the beautifully wrapped present. We were taught to receive each gift with thanksgiving. This was a special gift because it was the first gift our parents would allow us to open before Christmas Day. This is how I remember Christmas past.